Ryan Tannehill should be benched immediately! Ryan Tannehill should not play another down in the 2015 season. Just stand there and hold your clip board. I don't want to see you on the field at all. Last weekend's game against the Chargers was an abomination. Losing Branden Albert early in the contest, and, later, Mike Pouncey left the offensive line in the incapable hands of Dallas Thomas and Jamele Douglas. And let's be frank, Chargers OLB Melvin Ingram feasted on the ineptitude. Every fan knew that there was a problem on the front line going into this season. The offensive guard position has never been addressed since Richie Incognito left. Expecting Billy Turner and Dallas Thomas to fill those gaps has been a recipe for disaster. But with Ju'waun James, Mike Pouncey, and Branden Albert, the Dolphins have the foundation of a stellar offensive line, and limped along through 13 games. Now, with James out since week 8, and Pouncey and Albert both leaving Sunday's game with injuries, Ryan Tannehill took the beating of his lifetime. The Miami Dolphins have shown their commitment to Ryan Tannehill last offseason by signing him to a 96-million dollar contract extension. He is the quarterback of this team for the forseeable future. But this piecemeal offensive line is more likely to land him in the hospital than the end zone. So for this reason, the Dolphins should shut Tannehill down for the next two games and let Matt Moore finish out the season. 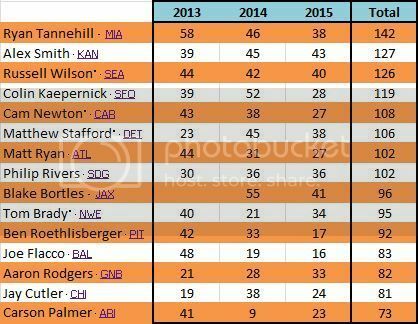 Ryan Tannehill has taken more abuse than any other QB the past 3 years. He has been sacked 142 times in that span, more than any other QB in the league. He also leads the league in "knockdowns" (although I wasn't able to find official stats on that one). Since entering the league, Ryan Tannehill has been in the top 8 in "times sacked" every season. And people wonder why he cuddles the ball when anyone gets near him... Kudos to him for not also leading the league in fumbles. And the knocks on Tannehill can all be traced back to this problem as well. Fan complaints of "pocket presence" and "inaccurate deep ball" all stem from confidence in the pocket. You have to be able to step up to make those plays, not always waiting for the next guy to slam you. In fact, Tannehill has completed more long balls (11) in 14 games this season than in any previous season. There's something to be said for a QB who takes this much punishment every Sunday and continues to get back up. Ryan Tannehill has never missed a start due to injury. The Dolphins have nothing left to play for in 2015 but a lower draft pick. There's no sense in letting your franchise QB risk injury that could affect next season, with a presumably new coaching regime and possibly new general manager and roster overhaul. So, thank you, Ryan, for your toughness and spirit as a leader, but take the next two weeks off as a paid vacation. Come back next year, ready to take this team to the postseason.